PaddyPower has a feature “my games” in their games section on their site. This is one of the first examples of personalization I’ve seen. I like the feature where you can save games you play often to a list, but it is not working very well when you move around the PaddyPower site. The option of saving games is not available in another sections of the website. The player sees the website as one gaming website where he can play all kinds of games, so it should be possible to access the games from every page and not like it is today where you have to be in the games section to access “my games”. 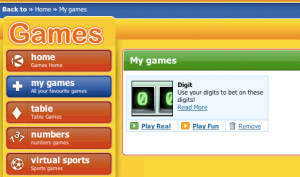 One reason that it just work in the games section might be that the feature is developed by the games supplier but it shouldn’t be too difficult to build a function that works for the whole website. ps. If you have seen personalization features on other gaming sites then make a reply on this post. ds.